Today our goal is to explore three Bible words/concepts that have been mistranslated and misconstrued, giving us a distorted sense of the real Jesus and what he also urged his followers to become. 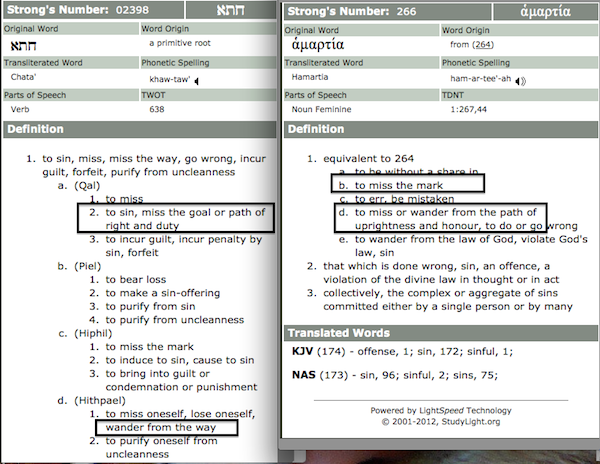 The three words (and their various forms) are sin, righteousness, and perfection. “For we do not have a high priest who cannot sympathize with our weaknesses, but one who has been tempted in all things as we are, yet without sin” (Heb. 4:15). We have a lot riding on this sinless doctrine and probably whole books have been devoted to it. But I’m going to keep it brief. I’ve been contemplating the meaning of sin for a long time now, based on my suspicions that we have been completely misled, thanks primarily to the Middle/Dark Ages traditions that grew up through the iron-fisted assertion of ascetic, personal piety (while purchasing indulgences to fill the coffers of the Church) in exchange for heaven. This teaching of sin being equated with personal morality goes completely against the developing plot of the Bible. I mean the real Bible, not the heavily mistranslated, distorted one that we read today in English. “He has told you, O man, what is good; and what does the LORD require of you but to do justice, to love kindness, and to walk humbly with your God” (Micah 6:8). “In everything, therefore, treat people the same way you want them to treat you, for this is the Law and the Prophets” (Matt. 7:12). “‘You shall love the Lord your God with all your heart, and with all your soul, and with all your mind.’ This is the great and foremost commandment. The second is (Greek: homo-ios) THE SAME AS it, ‘You shall love your neighbor as yourself.’ On these two commandments depend the whole Law and the Prophets” (Matt. 22:36-40). When we read that Jesus didn’t sin or didn’t miss the path, what it really means to me is that he never treated anyone badly. He recognized the God-nature in everyone and his oneness with all people. As a result, he was kind to everyone and, through his kindness to others, he demonstrated kindness to his Father. Sin isn’t about moral perfection, but about staying on the path to loving God by loving people—it is the SAME (homo) thing! Which leads to the next word—righteousness. 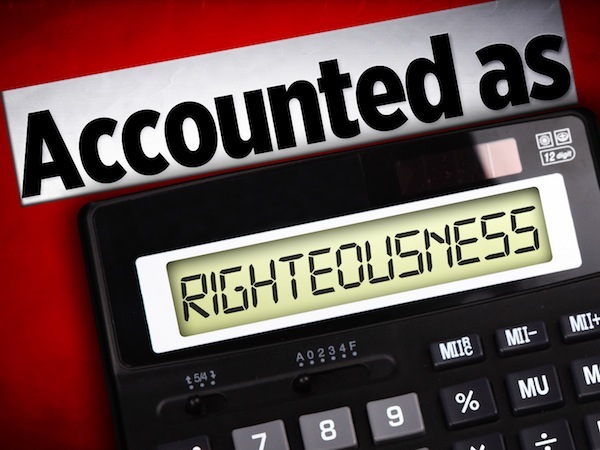 Jesus as “righteous.” In EVERY instance of the Greek or Hebrew forms of the word used for righteousness (i.e. 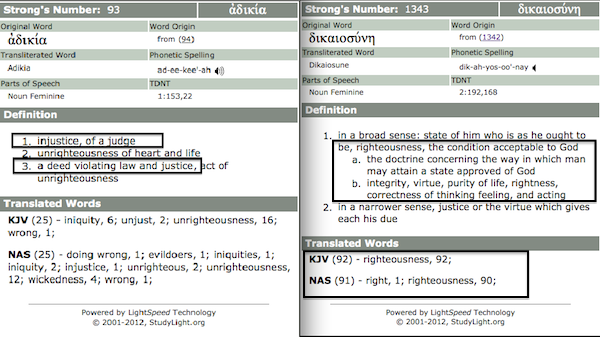 righteous, right), they are actually the word forms for the theme of justice. Righteousness was errantly (deliberately?) used to convey the translator slant toward personal morality and completely “misses the path” of what was intended. The whole Bible, when translated more correctly, makes an appeal for justice—treating others fairly, the way we want others to treat us. 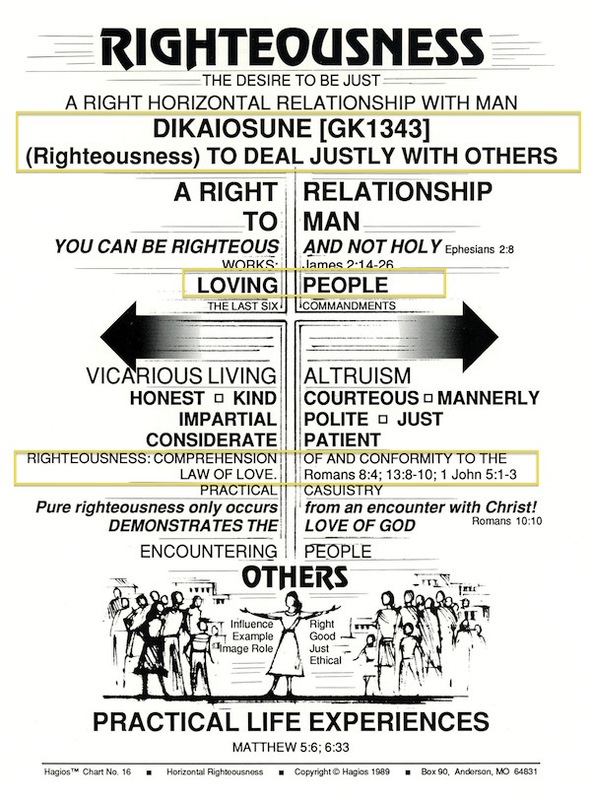 Notice in the following snapshot of studylight.org how the noun “dikaiosune” is presented primarily as personal morality and is translated as righteousness nearly 100% of the time, whereas the antonym of it at least introduces the justice definition. Strong’s even goes so far to say “in a narrower sense, justice” in order to skew the truer meaning. Yet the word dikaiosune ALWAYS conveys justice in an equitable and fair sense of the way we treat others and has nothing to do with personal holiness/purity/morality. If you don’t believe me, consult the online Koine Greek papyri or any of the contemporary Greek writers, and you will see what I am talking about. “All injustice—not treating others kindly and fairly—is sin…” (1 John 5:17). “As it is written, ‘There is none treating others kindly and fairly, not even one; there is none who understands, there is none who seeks for God; …their throat is an open grave, with their tongues they keep deceiving, the poison of asps is under their lips; whose mouth is full of cursing and bitterness; their feet are swift to shed blood, destruction and misery are in their paths, and the path of peace they have not known” (Rom. 3:10-18, selected). “For I say to you that unless your justice—treating others kindly and fairly—surpasses that of the scribes and Pharisees, you will not enter the kingdom of heaven” (Matt. 5:20). Man, that verse sure makes a heck of a lot more sense than the old way! “If we confess our sins, He is faithful and just to forgive us our sins (“missings”) and to cleanse us from all injustice” (1 John 1:9). As you can see, the fact that Jesus was sinless and righteous is not nearly as intimidating and out of reach as we once thought. It’s more about his conduct with others—a conduct he invited us to share upon the same path. Jesus lived on the path of justice and kind brotherly love…and he taught us to do the same. Some people know it as “The Golden Rule.” That is nearly, if not all, what his teachings were about. Jesus as “perfect.” But what of Jesus’s perfection? Surely there’s a word that separates him from the rest of us, right? Well, if that’s true, then why did he command us to be perfect? “Therefore you are to be perfect, as your heavenly Father is perfect” (Matt. 5:48). Who in the world can be perfect? Do a little study of the word “telos,” the Greek word from which “perfect” is always translated in the NT, and you will find something astonishing. The word telos does not mean morally perfect, as we have always been taught. Check it out for yourself. 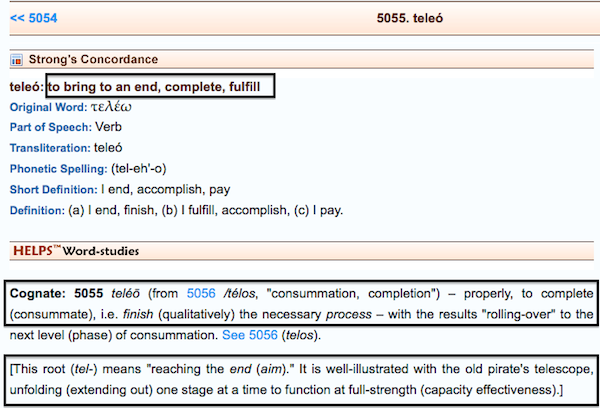 As you can see, telos is the word from which we get “telescope,” and it’s more about arriving at a goal, becoming complete, whole, or coming into clear focus on a target. And so Jesus was “made perfect” (Heb. 5:9, 7:28), according to the writer of Hebrews, in that he arrived at a place of completion—the mature, God-like son that his Father had always envisioned him to become. And that brings us to be ready to encounter our last topic in this series. Join in next time to find out why all this matters. What point am I making by suggesting that Jesus was more like one of us than we have ever heard about or realized? Does it make a difference in who we are today or where we are going? For your viewing pleasure, I am ending with a document I discovered while looking for my main blog photo. In a Christian world where righteousness has come to have little to do with our conduct with others and more to do with a list of dos and don’ts we are supposed to live by, I found it to be a nice compliment to our topic today. What do you think?